HMF design, supply and install pallet racking systems across West Sussex. HMF have been in partnership with Dexion for over 25 years, successfully installing the worlds leading Pallet Racking systems and servicing existing Pallet Racking installations. HMF supply high quality installations, offering a number of different racking manufacturers including Dexion Pallet Racking Systems, HILO Pallet Racking and Planned Storage Pallet Racking, Link 51 and others, making us flexible to also extend to an existing installation you may already have. Pallet Shelving Systems are used to store pallets which are usually accessed by fork Lift trucks or picking cranes. The quantity and size of pallets, combined with the level of access required will determine which type of pallet racking is selected. Some products are stored on a long term archive basis, first in last out, whilst others need to be stored on a first in first out system like the storage of food or medical products. Push Back Racking for storage density but accessed by non specialised fork trucks. The right design will determine the best system to use for your installation to maximise your pallet space utilisation. There are various racking systems available including narrow aisle pallet racking, pallet live storage, push back pallet racking, adjustable pallet racking, carton live storage pallet racking, vertical arm cantilever pallet racking and many more. Using our in-house AutoCAD design capabilities, we can ensure the full utilisation of your available storage space in your premises. Hampshire Mezzanine Floors will design the right Pallet Racking solution for your specific business requirements and will advise you on safety features, rack protection, fork truck requirements and anti-collapse mesh. 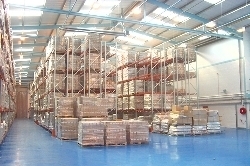 For more information on Pallet Racking Systems in West Sussex, please contact us. Hampshire Mezzanine Floors also offer a rack maintenance inspection service to check the safety and extent of damage to your racking. We will provide a safety report for your records and quotation for any rack repairs we feel necessary to maintain the safety of your warehouse. We are also able to undertake work in other areas of West Sussex, so please do contact us for more information and a no obligation quote.